Someone asks you to write something for their blog and you write about urine. Twice. You grab the throw blanket, see something that looks like dried jelly, and use the blanket anyways. You can clean it later. You talk about your kid then get weirded out when someone uses his name. Chicken nuggets and instant potatoes sound like a well-rounded meal. You think PG-13 might be a little much for your 6 year old, but seriously, you'd get at least 2 hours to yourself. Have fun kid! 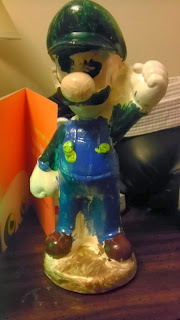 You are proud of a poorly painted Luigi. You understand everything that your kid says, even when no one else does. You think in rhyme because of the Dr. Seuss you read all the time. This is so true! Yay to being a mum! Every once in a while I won't understand what one of my kids says, but I have decided that that is what siblings are for! If I don't understand, one of the kids is sure to.